In case you haven’t heard about the Fourthcore Armory, consider this your moment of enlightenment. It’s a free PDF chalk full of awesome treasures for your 4th edition Dungeons & Dragons game ala the Adventurer’s Vault. However the items within this compendium are far more powerful, mythic and extraordinary than anything you’ve likely ever seen in 4e. They also bring about (and bring back) elements such as gambits, charged items, action point powered items and more. I’d divulge further detail regarding the level of awesome within the items and mechanics inside, but I’d rather you take a look for yourself by [download_link link=”http://slamdancr.com/toys/fca.pdf”]Downloading It (2.8MB)[/download_link]right now and you’ll see exactly what I’m talking about. Hats off to Sersa V, Mario Podeschi, Colin Oldenkamp, C. Steven Ross, Daniel Roanoke and the rest of the Fourthcore Crew that helped this fantastic supplement come to fruition. 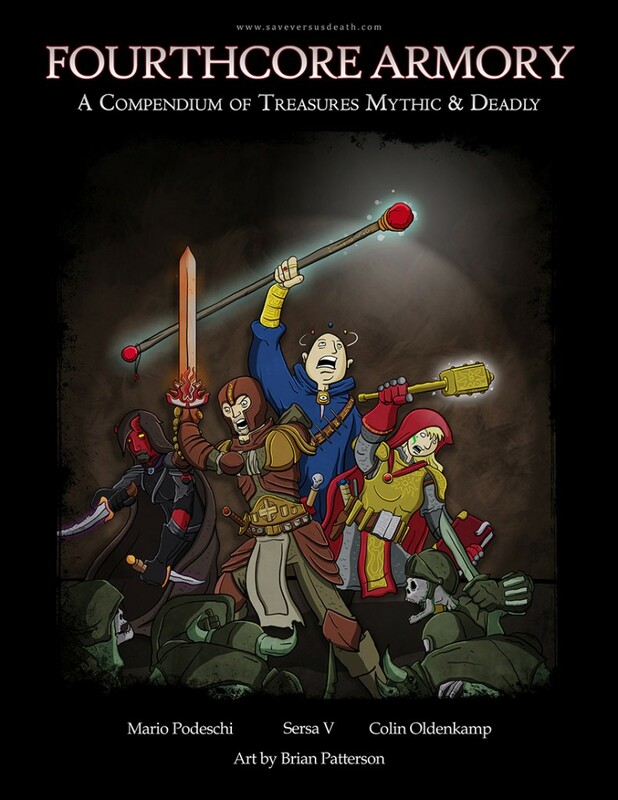 The cover art and all item illustrations were done by the amazing Brian Patterson of D20Monkey, be sure to give him props next time you stop by his site to read one of his hilarious comics.